Mobile Suit Gundam F91 (Japanese: 機動戦士ガンダムF91, Hepburn: Kidō Senshi Gandamu Fōmyura Nainti Wan) is a 1991 anime film. It was Gundam creator Yoshiyuki Tomino's attempt to launch a new Gundam saga, set 30 years after Char's Counterattack and 27 years after the later published Gundam Unicorn. He re-teamed with character designer Yoshikazu Yasuhiko and mecha designer Kunio Okawara for the occasion. The movie was first released in Japan on March 16, 1991. The movie is set 30 years after the events of Mobile Suit Gundam: Char's Counterattack and none of the characters that had previously appeared in the series were present in the film. Renewed conflict breaks out after a generation of peace in this continuation of the "Mobile Suit Gundam" anime saga. To accommodate the growing population, the Earth Federation has built new space colonies. But the Crossbone Vanguard decides to seize these cities to help establish its extraterrestrial empire. Now, reluctant hero Seabook Arno and his Gundam F91 must lead a fierce struggle for survival. 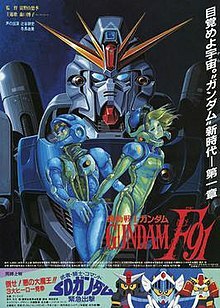 Originally planned as a full-length television series to mark the tenth anniversary of the Gundam franchise, Gundam F91 hit a production snag due to staff disputes, and the project was stopped after the screenplays for the first thirteen episodes were written. It was then decided that what was made of the show would be condensed into a theatrical feature film. A movie adaptation in the Gundam franchise had not been created since Char's Counterattack. Gundam F91 was developed with the goal of presenting a new era and new characters, at a time when SD Gundam was the representative of Gundam in movie theaters. Tomino commented apart from the actual announcement of the work that the theme of the film would involve family matters. Yoshikazu Yasuhiko and Kunio Okawara returned to work on the movie with Tomino to recreate the core team from the original Mobile Suit Gundam series. Yasuhiko hadn't done anything aside from character designs after Mobile Suit Gundam, but he participated on the condition that he would get to help create the story like he did in the original. In the end, however, he did not participate in the story's development, and instead arranged parts of the animation and designed and colored some elements, such as the normal suits (the space suits used in the film). Okawara returned from his design role in Mobile Suit Gundam ZZ to design every mobile suit that appeared in the movie. The mobile suits he designed were ones that came from conversations with Tomino, much like how it was when they worked on the original series, but they found themselves disagreeing on how radically to change the design elements and theme. Okawara originally took care to keep the number of lines in his designs to a minimum, as the difficulty of animating them for a feature-length film would increase, but Sunrise requested that he use as many lines as he could. The mobile suits for the movie were designed to be smaller than usual—their sizes had been generally increasing up until Char's Counterattack, where the Gundam was 18 meters tall but the Nu Gundam was 22 meters. The average size was brought down to about fifteen meters in Gundam F91, with Tomino explaining that it would be easier for when the mobile suits were made into model kits, as they would be more easily posed with equally scaled human figures and easier to build dioramas around, the same reason he offered for another animation series he worked on, Aura Battler Dunbine. Tomino originally wanted to decrease the size to 10 meters, but it was set at 15 meters to meet the requirements of manufacturers. In-universe, the shortening of mobile suits was explained as a way to combat the ever-growing costs of producing larger and larger mobile suits. In the same way, the model kits would also decrease in terms of manufacturing cost. In reality, however, as 1/144 scale model kits were becoming the norm instead of 1/100, the cost to develop new technology to color smaller kits and to create smaller, more articulated joints, among other things, actually drove the production cost up. However, this in-universe explanation met with dissatisfaction by fans of the franchise, especially model kit fans, so after retaining the smaller size through Mobile Suit Victory Gundam, starting with Mobile Fighter G Gundam the mobile suits were gradually increased in size once again. By the release of Turn-A Gundam and G-Saviour, the titular mobile suits stood at 20 and 18 meters, respectively. According to Tomino, the movie was designed to be easier to understand than the somewhat confusing Char's Counterattack. The main character was a more easily understood hero, and the story ended on a happier note. The theme of Char's Counterattack involved Newtypes, but Gundam F91 chose to go with the easily relatable concept of "family problems" as its main focus, which also made it easier to understand for newer fans of the series. As a result, Tomino has said that "story-wise, the movie was a success." The first part of the movie was presented in a clean, understandable way, but the second part got more chaotic, like Char's Counterattack, with situations only being explained with very brief dialogue – the layers of complicated story piled up, and in that sense it became a true successor to the Gundam movie adaptations. In the story, round, floating manslaughter weapons called "Bugs" were introduced in order to give more of a direct feel to the pain and violence depicted on screen than the poison gas used in Mobile Suit Gundam and Mobile Suit Zeta Gundam, though they had the same role of killing people. This is related to Tomino's strong belief at the time that children were "continuing to lose touch with real life." Gundam F91 was Sunrise's first movie that used wide-screen format materials for its production. Until then, all of Sunrise's movie productions had used normal-sized paper, which were then cut off at the top and bottom in order to adapt it to wide-screen. In production notes it was said that they would "certainly" continue with a sequel to Gundam F91, but a project for a continuation never materialized. Later on, however, Tomino was involved with the writing of the manga Mobile Suit Crossbone Gundam, which followed the movie's events to a certain extent. Tomino also wrote a two-part novelization that fleshed out more details of the story. After the film's release, the first six of eight of its film rolls smoothed out certain scenes, and about five minutes of footage was added to the last two rolls. They also had the voice actors re-dub the movie, and finally released the "director's cut" on VHS as "Mobile Suit Gundam F91: The Complete Version". The later DVD release contained both the original movie version and the complete version. However, rolls 1 through 6 on the movie version are actually from the revised, complete version, so the original movie version has never actually been released on home video. Moriguchi also performed "Mizu no hoshi e ai wo komete"; an opening theme for Mobile Suit Zeta Gundam. ^ Mobile Suit Gundam F91. Rapport Deluxe. This page was last edited on 26 March 2019, at 07:30 (UTC).